Lima festivities are full of colors and also faith. Lima is a multicultural city that is why you will find various festivals that occur throughout the city totally different from each other. The main points of the festivities are history, religion, sports, tourism, music, culture a great variety that attracts many tourist locals and foreign. Lima’s Foundation - January. It is celebrated each January 18th of every year with a number of artistic and cultural activities. It begins with a serenade, followed by a parade, parades, fireworks, and the whole town celebrates with theater, art exhibitions, music, food, among other activities. Carnival - February. Water games held every weekend in February. Also there are parades of allegorical cars in Miraflores and parades with colorful characters in Barranco. In the southern beaches carnivals are celebrated with costumes, parades, luau and a beauty queen contest. Grape, wine and canoeing Festival of Lunahuana - February. Grapes are treaded while people are singing, dancing and drinking. The public can taste different types of grapes, wine, and pisco cachina of the locality. Lunahuana is the largest producer of wine from the region and it is an ideal place to practice adventure sports. For this festival people organize a canoeing contest and others adventure contests. Vendimia Festival - March. Takes place in the old Surco district. It is celebrated visiting wineries to taste wine, cachinas and artisanal piscos; also people choose the Vendimia queen, they celebrate with music festivals, especially Afro-Peruvian music, typical gastronomy and others activities. Easter - March-April. People make a tour of the most representative colonial churches of the city, with different processions and masses. Also local people leave the city and make domestic tourism. Peruvian Show Horse (Festival Del Caballo de Paso Peruano) - April, 15–20, Celebrated in Pachacamac, Mamacona, south of the capital. The main feature of this horse is the side walk. The rider (chalan) and the horse are the dancers, because this horse dances to the rhythm of the Marinera. Also you can taste the local gastronomy and Peruvian Pisco. The Peruvian horse has been declared National Cultural Heritage. St. Peter and St. Paul (San Pedro y San Pablo) - June 29. San Pedro is the patron of fishermen. In Chorrillos and is Lurin people make a procession with the saint asking good fishing for the year. 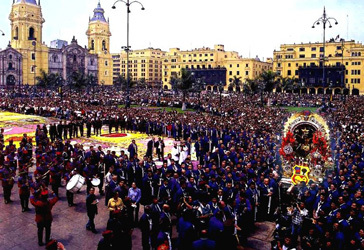 Festivities Patrias – July 28, 29. Many civic, cultural and artistic activities celebrate the Peruvian Independence. There is a parade along Brasil Avenue. Throughout the city there are different activities where Lima comes to share the festival: concerts, the traditional parade of the company Wong, in Miraflores, art exhibitions, Creole cooking, theater, circus, etc. Santa Rosa de Lima - August 30. Considered as the saint patron of America, Peru and the Philippines and the national police. Month of the Lord of Miracles - October 18, 27 and 28. A traditional festival in the capital. The procession goes out to accompany the effigy of the Lord of Miracles which goes on a platform above the crowd, with prayers, chants and incense. The entire city is dressed in purple and is the opportunity to taste traditional Turron de Doña and Creole food like Anticuchos. Bullfighting season - October - November. Takes Places in the Plaza de Acho, district of Rimac. Many famous bullfighters come from Spain and America.